From the road, the house is hidden from view. Once you pass through the gate and the car tires gently roll down the unpaved rock road swinging around the bend and curving slightly toward vast olive groves and vineyards, Villa Oliveto appears. Then your gaze alternates from the Villa to the opposite direction, past the orchards and hills to an impressive structure standing proudly in the distance. What is it? Yes, it is "Il Duomo di Firenze," designed by Filippo Brunelleschi! And in the late afternoon, past farmlands and rolling hills, the glorious Tuscan light illuminates Florentine landmarks as if guided by a higher power. Villa Oliveto is quiet and tranquil. No crowds. Living here is peaceful and relaxing. Hiking though through the olive groves rejuvenates the mind, body and spirit. Eight adults (most new acquaintances to one another) were giddy with excitement at this auspicious gathering! For the next 7 days we remained elated as we fully embraced "La Dolce Villa" as our Italian home. Some days we broke into small groups and scoped out the local area, chatting as we strolled under the shade of the olive trees. We met a pair of darling donkeys who were tucked away on the edge of the property. Our group quickly became fast friends. One couple began each day with a quick plunge into the pool! We enjoyed Restorative Yoga in the upstairs living room with the tall windows open wide to let in the afternoon breeze. As the sun began to set, we gathered for Apericena under the umbrellas or vine covered pergola and shared our daily adventures - a pre-dawn photo shoot in Florence, bike touring around Florence, visiting a winery and discovering ancient towns, museum hopping and gelato sampling. The evening's escapades commenced in the chef’s kitchen which contained every conceivable gadget, pot, pan, stemware and china. This backdrop allowed the serious cooks to create fabulous dinners while the mischievous assistants maximized merriment when grating the Parmesan Reggiano or mixing the Villa's official apéritif, "Aperol Spritz," made of Prosecco, Aperol and soda water over ice. Pre-dinner deliberation regarding wine for the evening was serious and thoughtful. Even setting a lovely dinner table became an artful presentation with candles and wild flowers from the garden. We embraced the Tuscan reverence for preparing and sharing meals with good friends. Imagine staying in luxury lodging for free (or pretty close to it). Homes offered for exchange are situated all over the world - Italy, U.S., Costa Rica, Bahamas, China, Scotland, England, America, Dominican Republic, Australia, Fiji, Spain, Indonesia, Croatia, and Morocco. Home exchanges (also called "home swaps" or "house swaps") are an increasingly popular, Web-sourced mode of luxury travel. Home exchanges are an alternative to hotels. Participants simply live in each other's home during their vacations. And some of the homes are quite spectacular: beach houses, country estates, city townhouses, lakeside chalets and architect-designed showplaces. And if you don't have a second home to put into the pool, THIRDHOME now offers property rentals! If you want to learn more about THIRDHOME, just click here. Tuscany or Toscana is a region located in central Italy that stretches from the Apennine Alps to the Tyrrhenian Sea. The characteristic landscape is a blend of gentle rolling hills leading to sharply peaked mountains that pose a barrier between Tuscany and regions to the south. People have inhabited this beautiful part of the world for thousands of years. Ruins of the ancient Etruscan civilization (which predated the Roman Empire) are scattered throughout the back roads. 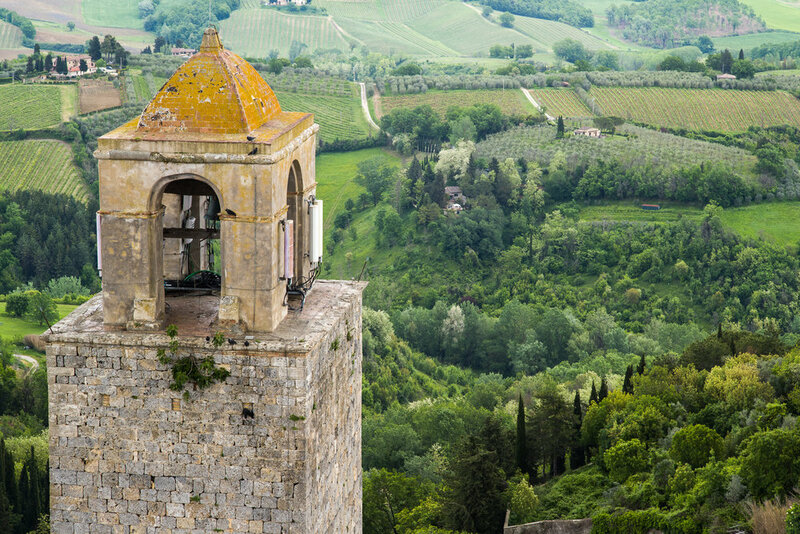 Tuscany has two distinct appearances - the art cities like Florence, Siena, Lucca and Pisa as well as the countryside sprinkled with small towns, villages, castles, villas and vineyards. The word "Tuscan" evolved from "Etruscan" and now serves as a marketing modifier, a cultural indicator and even a life-style choice. The word "Tuscan" influences design, fashion, decor, epicurean lifestyle and evokes a "Bella Vita" or "good life" philosophy. The Etruscan tribes settled in the area about 1000 BCE and credited for teaching the Romans the art of civilization, including war and conquest. The Romans were good students because their strength and power grew and the Etruscans eventually vanished. The Romans built the cities of Florence, Pisa, Lucca and Siena and connected them by roads allowing the movement of goods and the military. The Barbarian Invasion brought about the end of the Western Roman empire and the walled Tuscan cities transitioned into city-states. As Charlemagne's Holy Roman Empire grew in power, rich Tuscany became a region of great desire. Today's tourists enjoy the ruins of magnificient walled cities, monasteries and fortified castles that were constructed during this time to fend off invaders. In 1089, at the age of 43, the Great Countess, Matilda (the most powerful woman in Italy, at the time) married the 17-year-old Welf V, duke of Bavaria and Carinthia. She sometimes fought in armor at the head of her troops in the wars between the Pope and the Holy Roman Emperor. Matilda finally made peace with Henry V and donated her territorial possessions to him. However, she had already gifted them to the Pope, an act that later provoked controversy between papacy and empire. The House of Medici was the Italian family that ruled Florence and later Tuscany during most of the period from 1434 to 1737. They first attained immense wealth and political power in Florence through their success in commerce and banking. With the rise to power of Cosimo de’ Medici (or Cosimo the Elder), the family’s support of the arts and humanities transformed Florence into the cradle of the Renaissance, a cultural flowering rivaled only by that of ancient Greece. Walk the streets in Florence and you see the remnants of Medici power and wealth on display. The house of Medici funded the work of masters like Botticelli, Da Vinci, Galileo and Michelangelo. Seems like just about everyone wants a Tuscan Villa! Napoleon Bonaparte made his mark by conquering the region in 1807 and gifting it to his sister, Maria Anna Elisa Bonaparte Baciocchi Levoy who became the Grand Duchess of Tuscany. Before you take off on an excursion be sure to schedule time each day for "Meriggiare" which roughly means “to escape the heat of the midday sun by resting in the shade.” Savoring a scoop or two of gelato is excellent example of Meriggiare! And before dinner, make sure you carve out time for "Apericena" which means "pre-dinner drinks accompanied by food." Practice this phrase until it rolls off your tongue and then say it like you mean it! "Non tutte le ciambelle riescono col buco" which means "Things don’t always turn out as planned" and literally translates to “Not all doughnuts come out with a hole.” This philosophy will serve you well as you get lost in the hills on the way to your destination. The Tuscan region is populated with small and large wineries. Best to make contact before you plan to visit. The enormous Antinori Winery and beautiful Il Borro (owned by the Ferragamo family) are two famous ones but there are many small, family owned and operated establishments that welcome visitors. And if you get lost along the way, remember ... Non tutte le ciambelle riescono col buco! An interesting day trip is San Gimignano or the "Manhattan of the Middle Ages" where tower projects went out of control! Only 15 of the original 72 towers remain standing but they are visually impressive and the skyline is unique. It is impossible to miss Porta San Giovanni, the main gate, which was constructed in 1262. These tall towers were constructed to demonstrate power of the wealthy townspeople. The town is a UNESCO world heritage site. No visit is complete without sampling and perhaps purchasing the local white wine, "Vernaccia di San Gimignano." Fiesole is where the Florentine aristocracy retired to escape the heat of the big city. This small town hides a wealth of surprises like 8th century BCE Etruscan walls, ancient Roman baths, the very hill where Leonardo da Vinci experimented with the concept of flight and a Roman amphitheater which serves as the stage for the EstateFiesolana summer events. If your day trips include driving, you will need to refuel yourself and your ride. Along the Autostrada you might spot the occasional red-and-white Autogrill, (Italy's answer to fast food) and it's worth a stop. Not only do they have everything you need, many travelers boldly proclaim that Autogrill makes the best 1 Euro espresso in Italy! Once you and your auto are full, back you go on your merry way to the marvelous countryside filled with green grass and trees merging with blue sky, violet and golden wildflowers, terra cotta villas and slate farmhouses. A drive along the Tuscan back roads is a visual feast! Sometimes you zig when you should zag! Make a mantra of these wise words from Frances Mayes in Under the Tuscan Sun, "My idea of heaven still is to drive the gravel farm roads of Umbria and Tuscany, very pleasantly lost." Tip - Unless you have lived in the region, do yourself and your passengers a favor - double the time your navigation system estimates the trip will take. These country roads are an adventure! And, if you happen to arrive early and find the perfect place to park, celebrate with gelato or espresso! The Tuscan capital, Florence, is the home of the powerful Medici family. During the 13th-15th centuries, they amassed a tremendous fortune through trade and commerce rather than war. Largely through their patronage painters, sculptors and architects flourished. In many ways the Medici family funded the Renaissance. No trip to Tuscany is complete without a visit to Florence to see Michelangelo's David or Filippo Brunelleschi's Duomo. The Uffizi Museum (former administration offices for the Medici) includes masterpieces of Michelangelo, Galelio, Caravaggio and many others. A visit to the Uffizi is a large undertaking because the galleries and halls host hundreds of paintings and sculptures. Be sure to wear comfortable shoes. About half way through the galleries, there is a reasonably priced cafe with indoor and outdoor seating. After your visit, stroll through the public markets, sip a cappuccino and enjoy a gelato. Walk over the Ponte Vecchio bridge. One day in Florence is not enough to sample all that it has to offer. One morning we arrived in Florence before sunrise and well in advance of the crowds. During these quiet hours, the city of the Medici belongs to the early risers. Walking the streets you sense the city slowly waking up as towns people ride their vespas and bicycles to work. If you walk by the Duomo at dawn, you might glimpse nuns walking quietly to their morning prayers. It is a magical city in the morning light. A successful visit requires planning. The city of Florence is congested regardless of the time of year. Tip - Pre-purchase tickets to view Michelangelo's David at L'Accademia and at the Uffizi as well as current exhibitions. If museums and cultural tours are your main objective, stay close to the old town so that walking or hopping a bus to your destination is easy. If you are new to Florence (and even if you visited on the cheap 20 years ago and have fond memories of lugging a backpack on public transportation in a much smaller city) stay in a central location. Yes! it will be more expensive than the outskirts. Driving in Florence is challenging, parking is stressful, costly and time consuming. If you insist on driving, arriving in town early (before 7am) on weekdays is a useful strategy but you pay for the luxury of in town parking. On Sundays parking is free! throughout the city which means everyone wants a parking space! So on Sunday, arrive by 9am and prepare to walk. Tip - Arrive at museums and "jump the line" tours 30 minutes ahead of scheduled entry time. Be prepared to stand in line anyway (just not as long). Carefully read instructions on your ticket about entry the day before. Sometimes you need to exchange your computer ticket for a different one and this will likely mean going out of your way to a kiosk. A conscientious concierge can likely get tickets and reservations for you if you plan ahead. Sign up with your email address to receive news and updates from Travel is Beautiful. There are two sides of Tuscany, the cities and the country. Why not enjoy both? There is no place like Florence due to its unique character, though the crowds tend to be large. And the Tuscan hills have an incomparable charm derived from people who lived and died defending the fertile hills for thousands of years. Ribbons of road ramble through olive groves, vineyards, castles, palaces and villages. Every small hamlet has a cafe to welcome visitors and locals. If you stop, you will likely create a memory.